Homeonwers looking for a saw for many jobs should consider the Hitachi C10fCE2 model. It comes with several handy features and will easily fit on a work bench. 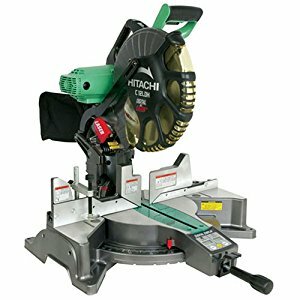 Read on for a full Hitachi Miter saw review below. Easy to use and adjustable. It comes with a 45 degree miter adjustment in either direction. This is useful for angled cuts on trim and for construction of wood boxes or framing. Powerful 15 amp motor. This is useful for larger boards, like decking, heavy lumber, and boards for framing. This makes it handy for a variety of renovation and building projects around the house. Quiet and smooth. The saw comes with a handle built to reduce vibration. Buyers say the saw is also quiet to operate, so neighbors won’t be disturbed by frequent work on a project that might take several days or weeks. Large base. This makes the saw more useful for cutting longer boards and larger pieces of lumber. Users can tackle both small and larger jobs with a saw that has the right support. Five year warranty. Buyers say this is one of the best warranties in the industry, for this type of product. Requires assembly. Though many buyers say it only takes five minutes, a beginner may need more time to assemble the saw. The fence is the only assembly required. But, some buyers may need to adjust the miter and the laser. Heavy. Many users don’t mind the weight, because they believe the saw is well built. However, this many be a consideration for jobs where the saw needs to be moved or transported to a new address. May need to purchase a different blade. The blade that comes with the saw is suitable for a variety of jobs. But, for cutting hardwood and plywood, users who want a smoother cut and want to eliminate chipping may want to buy a blade with more teeth. What is the price of this miter saw?The Hitachi C10FCE2 is priced between $100 and $150. Most buyers consider it a good value. Does the saw come with a table? No. The saw must be mounted to a work bench, to make it stable for use. How much does the saw weigh? The saw weights 35.9 pounds. Does the laser stay on? No. The laser can be turned on and off, according to user preference. Will this saw cut posts? The saw comes with a ten inch, 24 tooth blade. It can cut up to a 4 inch thickness, so it can cut standard posts for decking and fencing. This saw may be the best miter saw for a homeowner who takes on a variety of jobs, whether in building, renovations, or a combination of jobs. It’s suitable for outdoor landscaping projects, as well as for indoor framing and carpentry jobs. The saw is reasonably prices, compared to similar products on the market. It also comes with a strong warranty, which is desirable for anyone buying power tools that will be used at home frequently.